Lifeboat Lady is very sorry to have to record the death on 8th August of Sherwin Chase. 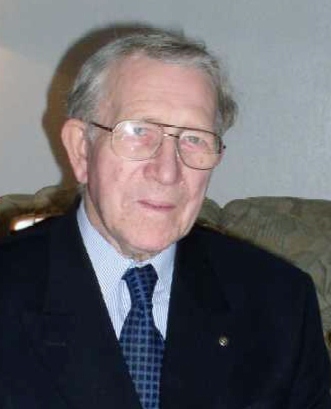 Sherwin was one of the Founders of the Thurrock Branch of RNLI back in the 1950s, later becoming its long-time Chairman and President. It was a real lifeboat family as Sherwin’s late wife, Betty, was Branch Secretary and Treasurer. Sherwin led the Branch’s efforts over the years to raise a huge amount of money for RNLI, but as well he was a presenter giving talks to local groups about the lifeboats. Always practical, Sherwin could make, alter and repair anything, and that led him to be one of a small group who built a one-third size copy of a Brede class lifeboat. It was correct down to the smallest detail, and had its own set of signal flags. Over the next 50 plus years it has been used not just by Thurrock Branch but by neighbouring groups to raise thousands for RNLI. And it still exists to this day, used less, but still useful. He and his pals built another boat, too; an earlier type of pulling and sailing lifeboat, (sails if there’s wind, and oars if not). The two boats were named the Henry de Grey and the Catherine de Grey after the de Grey family who were Lords of the Manor of the area in the 12th century and gave their name to the town of Grays Thurrock. That perhaps showed Sherwin’s great interest in history. He was an active member of the Thurrock Local History Society, with his speciality being maritime history. He contributed articles to magazines and journals and gave talks on maritime matters particularly Thames barges and the training ships moored off Grays. He was an avid collector of maritime historical items, especially if there were a link to Lord Nelson – his hero. He also collected memorabilia from Royal Navy and Merchant Navy ships, and Royal Yachts, but was prepared to include the Army and RAF if something took his eye. One of his most treasured items was the bell from HMS Malcolm as that is his son’s name. Over the years he had loaned items for exhibitions locally at Thurrock Museum and at Purfleet Garrison Museum, and nationally to such august bodies as the Greenwich Maritime Museum and Portsmouth National Maritime Museum. Sherwin was a member of Corringham Thameside Rotary Club, being a Past President. He continued to attend the weekly meetings, whenever his health allowed, until quite recently. His other interests included singing for many years as a member of the Thurrock Male Voice Choir. Sherwin was born in Grays in 1927, and lived here all his life. His father was the Manager of Mitchell’s department store in the town. He was a Local Government Officer with the local Council. He had one son, Malcolm, who is an academic historian. In recent years he had much ill-health which restricted his activities and meant he often had to turn down invitations to special national maritime history events. He was much irked by his physical condition stopping him doing the things he enjoyed. He spent his last few weeks in Basildon Hospital with complications following major surgery, and died there last Wednesday. Sherwin Chase held all the badges awarded to volunteers by RNLI, including the Gold Badge and Bar. In 1999 he was made an Honorary Life Governor of the RNLI. Although Sherwin had necessarily withdrawn from the local lifeboat branch some six or so years ago, it is quite remarkable that any mention of RNLI in the Thurrock area still brings the response, “Oh yes, Sherwin Chase”. He will be much missed in Thurrock, not least by Lifeboat Lady who was privileged to call him a friend.